The Government wants to sell a large portion of “Government Hill”, the site of the current Government offices, to a private company for an office development and public car park. The argument used is that Hong Kong is short of office space, and businesses are suffering under sky rocketing rents. Twenty NGO’s have submitted an application to the Town Planning Board to rezone the Central Government Offices site to a special heritage zone. They want to retain “Government Hill” for future generations. Designing Hong Kong is one of the proponents. The Government response to our submission has been negative. This bias was to be expected as the Government itself decided on the sale of the site in the first place. 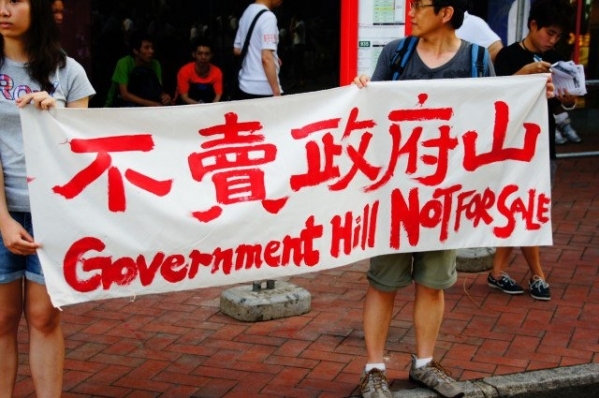 The NGO’s who propose to save Government Hill are greatly concerned that the Town Planning Board’s review of its application will be biased too: the Chairman of the Town Planning Board is the Permanent Secretary of Development, the Secretariat of the Town Planning Board is the Planning Department, and all the members are appointed by Government! We call on your support for a fair consideration of the application and for the retention of “Government Hill” in public ownership as a heritage site. Support “Government Hill is not for sale” campaign on-line on or before the Town Planning Board deadline: Tuesday 5 July 2011. It only takes a minute of your time. * Private developers are converting property in Tsimshatsui, Kwun Tong, Kowloon Bay and Quarry Bay into office space, however, the communications between these buildings is cumbersome relative to what we are used to in Central. New thoughts on transport planning around the harbour are needed to address this. With few development sites remaining in Central and the lack of a concentrated new commercial development in West Kowloon, the last available alternatives for dense prime and grade A office nodes along Victoria Harbour are for the short term a rethink of how many ‘Canary Wharfs’ we will build in Kai Tak (by moving the stadium to the New Territories) or - in the long term - by moving our container ports.